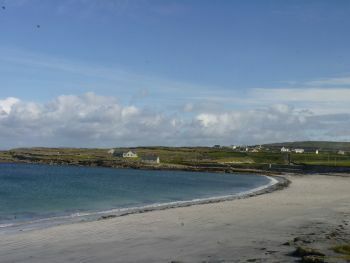 Inis Mór is one of the top tourist attractions in Ireland. You can get to Inishmore from either Rossaveal in Connemara or from Doolin in County Clare by ferry. If you are staying in Galway city, you can combine your Aran Island Ferry ticket with a ticket for bus transfer to Rossaveal. You can fly as well with Aer Arann. All the islands have airfields, and seeing them from the air is a great experience. 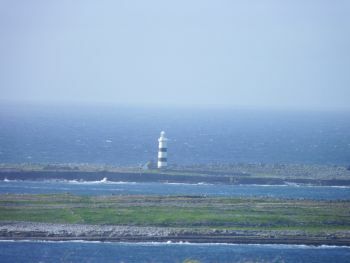 Inis Mór is the busiest and biggest of the Aran Islands. 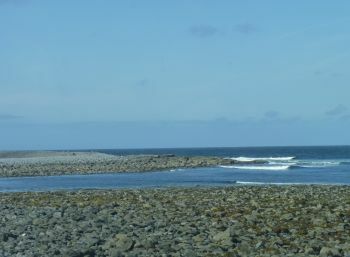 The name means ‘the big island’, the locals call it ‘Aran’ which means the same thing in Irish. Because it gets the most visitors, it is the most developed of the islands. You will find most facilities in Kilronan, the islands’ biggest village, where the ferry port is located. Kilronan is blessed with a biggish supermarket with an ATM, and even a fast food joint, our own Irish Supermac’s in the same building, five minutes walk from the pier in Kilronan. The tourist office opposite the pier is a good place to drop into for all the local information. There is a Heritage Centre on the outskirts of the village on the road that leads West towards Bun Gabhla which offers internet access as well as an informative exhibition. Kilronan also has a Post Office, a Bank of Ireland, a top-class playground, a new medical centre, and a community hall which, during the summer months, has shows of Irish Music and Dance (Ragús) not to be missed. At the Kilronan pier of Inishmore you will be met by people offering mini bus tours in anything ranging from a van to larger busses. Those tours are meant for day trippers and will bring you close to Dún Aengus with a 30 minute walk up to the fort via the visitor centre and passing some craft shops and a cafe. 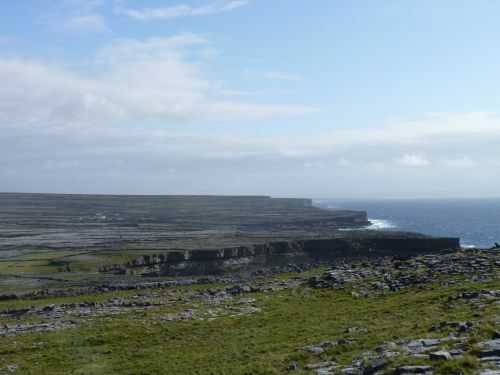 Dún Aengus alone is worth the trip to the Aran Islands. It is a prehistoric stone fort perching on the edge of 90 metre tall cliffs with the Atlantic right underneath. On those tours, you will also see The Seven Churches, (an Early Christian site) a seal colony, and the most Western point of the island, although you may not have the time to get out and look around everywhere. You can also approach mini bus drivers for a taxi service for your group, negotiating a fee. Cycling is a great option for those who want to feel close to nature. Bikes can be rented from a couple of shops near the pier. But, if you are cycling, a day visit is probably a bit short for a satisfying visit. If you are cycling for a couple of days, you can follow the Inis Mór Way, a route 50 kilometres long around the island. Look out for the yellow marker posts. If you plan to walk the island, definitely plan more than a day trip to get the best out of it. You can break up the Inis Mór Way into shorter walks choosing just one or two sights to focus on for the day. There is a local bus service from Kilronan to Bun Gabhla roughly three times a day which can bring you on your way. Find out the timetable from the tourist office. Another way to get around is by pony and trap, great fun on a fine day, and a memory kids will cherish. The pony and trap operators charge depending on how far you go. That means you can negotiate your own island tour. 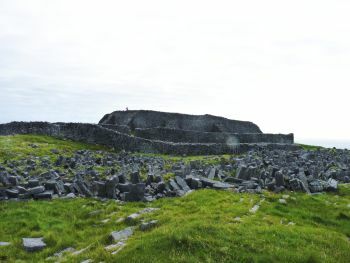 Dun aengus hill fort on Inishmore, one of the main attractions. The Island Heritage Centre on the outskirts of Kilronan will give you great insight into the islands culture. The centre has a daily screening of the 1934 film classic ‘Man of Aran’ that describes life on the islands in the old days, and there is a worthwhile, informative exhibition. First and foremost, there are the great and spectacular stone forts of Inis Mór (Inishmore), Dún Aengus and Dún Dúcathair (The Black Fort). Watch our video below and get an impression of what it's like up there! 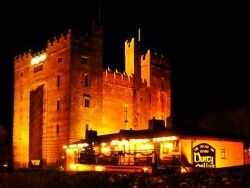 Dún Aengus is typically the destination of most day trippers, but if you stay longer, make sure to see the Black Fort as well. It is equally as spectacular and bewildering as Dún Aengus leaving you to wonder how people could have lived here...but they did. There is also Dún Eoghanachta, a perfectly circular fort which is visible from the main road between Kilmurvey beach and Bun Gabhla, and Dún Eochla on the road between Kilronan and Kilmurvey which was reconstructed in the 19th century. All are worth a visit to appreciate the ancient culture of the islands dating from the Bronze Age. Seven Churches early Christian site. 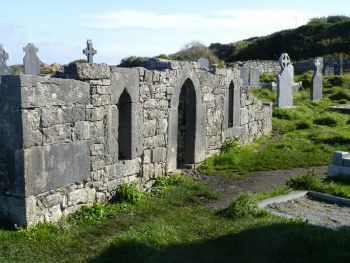 There is a fine selection of Early Christian sites on Inishmore which are worth exploring to get a feel for this Golden Age of Irish culture. Consider visiting St. Enda’s monastery near Killeaney which has a Saints’ bed (which is said to cure your illness if you sleep on it...let us know how you get on) and a Holy Well, as well as ruins of all the old buildings that were part of this important complex founded by St. Enda. Saint Ciaran, St. Columcille, and St. Brendan were all educated here. The next biggest place in order of importance would be The Seven Churches (Na Seacht dTeampall) near the Western end of the island, a complex that was founded by Saint Brecan and was a pilgrimage place en route to Rome. Saint Ciarans’ Church (Teampall Chiaráin) near the coast at Mainistir is a great destination. 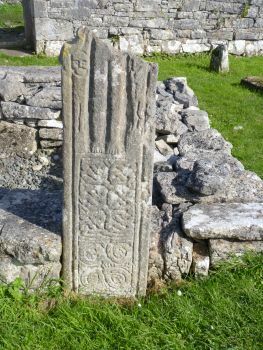 Look out for the large stone slab with a hole in it through which people used to pass a handkerchief for good luck, a great example for how Pagan and Christian beliefs melted together in Medieval Ireland. The Church of the Four Beauties (Teampall An Cheathair Alainn) is a beautiful 15th century church on the road between Kilronan and Oatquarter. This place is named after the four Saints that used to live here. 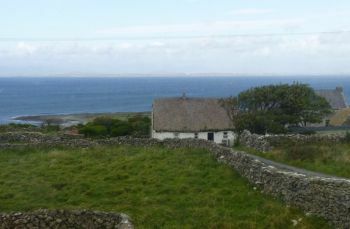 Find out more about the history of the Aran Islands and the sites mentioned above here. Where to start talking about natural beauty on this stunning island!? The entire South coast is lined by tall cliffs overlooking the Atlantic Ocean. At Dún Aengus they measure 90 metres in height. The cliffs are rough and beautiful at the same time. They make me feel humble when I think of my modest size compared to theirs. They also make me think of all of our distant, distant past: We came from the ocean below. Towards the South West you can visit the (dangerous) Puffing Holes, actual holes in the cliffs that reach down to the ocean. These are places where the sea is undermining the rock formations and gradually eroding them which is the sort of thing that might have happened at the Black Fort when parts of it dropped into the sea in the 19th century. At Kilmurvey, there is a lovely sheltered beach in a small bay, a nice and safe place for a swim, and to let the kids play in the sand. Make sure also to visit the Westernmost tip of the island at Bun Gabhla. Listen out for the sounds around you: You might hear the ocean, you might hear a dog barking in the village, you will hear your own footsteps, but not much else. To me, this place does feel like the end of the world. The end of A world, rather. Next stop- America. There is a wide selection of accommodation on the island, something for every budget. The island has a modern hotel at Kilronan, Óstan Árann (099-61104). There are plenty of B and B’s, a good handful in Kilronan alone. Pier House directly at the pier is an obvious choice (099-61417), and Seacrest also offers very good quality (099-61292). Ask the tourist office (099-61263) for a more comprehensive list of B and B’s and self-catering accommodation. There are three hostels, Kilronan Hostel (above a Kilronan pub) (099-61255), the comfortable Pilgrim Hostel which has a very good reputation for good food in Killeaney (099-61393) which offers the option to camp in the garden, and Mainistir House Hostel in Mainistir (099-61169) which is famous for their very good mostly vegetarian evening buffet, we loved the buffet, (open for bookings even if you are not staying there). There is also a very basic campsite on the road West from Kilronan. As far as we know they don’t have any showers and no kitchen, but it might be a last minute solution if everywhere else on Inishmore is booked out in high season (099-61185). Hi there, if you like what we do on this website, please support us and tell all your friends about us! We have handy social options for this purpose both at the top left and at the bottom!